This is a pithy tweet Instagram Saturday asked its users to take their troubles patiently. The popular network sharing photos online has encountered malfunctions preventing the use of the site. The problem is not yet known, three days after the breakdown: a default server appears to be the case, but no official information comes confirm or deny. Instagram, bought by Facebook there two years ago, has 200 million users worldwide. This service for sharing photos and an application available on iOS, Android and Windows Phone. Very appreciated, it is best known for photographs of dishes and selfies that made its reputation. 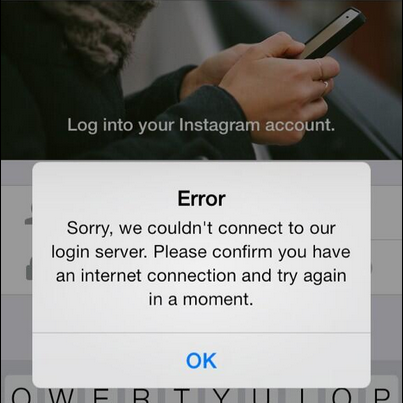 So when Instagram fails, we can expect many demonstrations of frustration. The unavailability of the service seems to have been global and lasted a few hours: the wrath of users is expressed via Twitter. 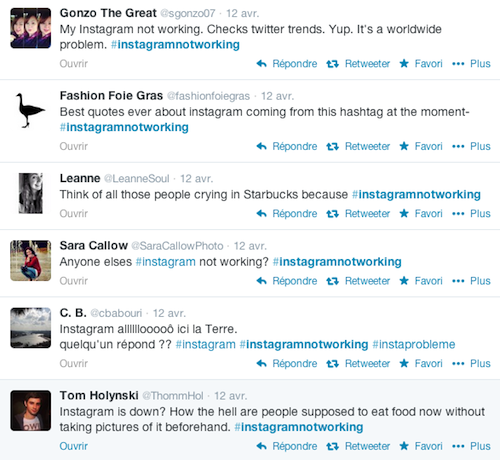 The hashtag #Instagramisdown and #Instagramnotworking flourished in the tweets of users. Faced with the breakdown of Instagram, users are moved quickly to social networking sites, namely Twitter. The reactions were sharp, showing users frustrated at not being able to share their photos on the social network unavailable. The tweets ranged from anger and derision. What to remember about this "deal" is the incredible ability of Twitter to make the relay users when they are faced with a problem. When the company in question does not communicate its failures, Twitter is heavily used both as a source of information as a means of expression discontent.